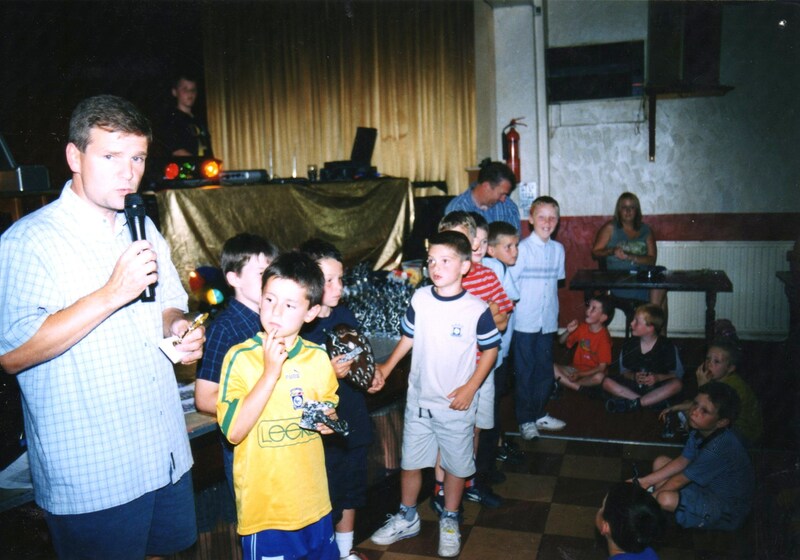 Here are some Hepworth United photos, memories and reflections on the day when the new football season started for Huw’s team mates, now in the Under 16s. Just like the first day at school last week, the first competitive match of season is a time when Hepworth’s number 2 has been remembered with love. As everyone knows, Huw was so proud to play for Hepworth and had (like the other lads do) fantastic memories that provided a lot of meaning in his life. Huw remembers those first training sessions with little footballs in the school sports hall from 2002, the first competition win at Penistone in 2003, and a great season in 2004 when the lads won the A and B team tournaments at Scissett, the tournament at Honley and were runners up at West End. And Huw was proud to be a member of the team that won the league in their first competitive seasons in 2004-5 and 2005-6 with cup wins in 2005-6 and 2006-7. The photos in the slide show below are from these early years, which gave the players, parents and coaches so much pleasure. Those were special years, the memories are very precious for all the players and particularly the memories of the big guy who wore the number 2 shirt with pride. Memories of that summer’s day at West End in 2004 when it hammered with rain so much that the start of the final had to be postponed – the lads were like drowned rats – unlike the opposition who had a tent. We bought a tent straight after that and the lads were able to prepare for tournaments in relative comfort. We never quite got the nack of putting that tent up without a lot of mucking about with the other parents – not that the lads noticed – they were too busy kicking a ball around and generally messing about while we slaved with the tent! And the memories of both those cup final wins in 2006 and 2007 are special too – beautiful spring days, lots of smiles and honest endeavour. Photo calls; excited parents, brothers and sisters, grandparents and friends; tension; coaches nervously shouting advice; and ultimately wild celebrations – including a night in Piccolinos which resulted in the cup being broken 🙂 They are days that many of us will treasure for the rest of their lives. Huw developed in the later years to be a lynch pin of the side where he often dominated opponents with his physical presence but also had great feet and set up many a goal with through balls from deep positions. Huw was a towering presence in his last few seasons – fantastic in the air, strong on the ground and great with the ball at his feet. And if anyone got hurt in a challenge with him, he’d say sorry – that was the caring side of the big guy 🙂 Most of all Huw just enjoyed playing football with his mates – he loved being with his friends and being part of a team with lads he adored. Huw won player of the season in 2010 and had also had a great year in 2010-11. Indeed he as in fine form on 13th March in Brighouse including the pre match banter, half time time talk and an outstanding footballing performance. This season we have some additional numbers and quality in the team, and the spirit seems to me to be superb. The first training session was emotive without Huw there, but we had a great laugh with the second session with some fitness work which some of us found very amusing, as well as being hard work. Having a laugh and a great spirit is a great testament to Huw, who is missed every time that team of wonderful lads takes the pitch. The lads have had an excellent pre season with 3 friendly wins including one at Penistone which is always full of memories from that tournament back in 2003 (where Huw shared big Ry’s salami sandwiches,) to last September and December when Huw played at Penistone in winning teams with strong performances and a headed goal in one of the games. The lads won their first competitive match on Sunday 11th September which was a fixture in the Sheffield Cup. Great credit to the players for the character and genuine togetherness they have shown over the last 6 months and they will have a great season on the pitch and as a group of great mates.